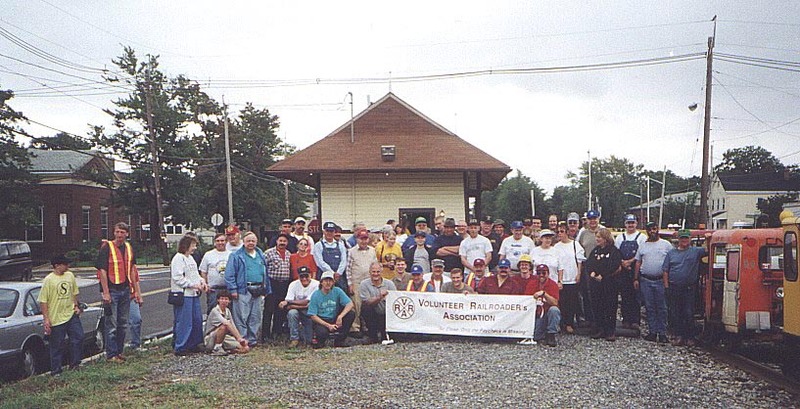 Get Involved in the Volunteer Railroaders Association – Volunteer Railroader Association Inc. The VRA publishes a quarterly newsletter called “The DIGEST“, holds quarterly meetings at the St. Clements Church in Hawthorne, maintains this website and gets involved in all kinds of railroad projects. We offer our members the chance to learn how to operate motorcars in a safe and enjoyable manner. Once they have passed our test, many have moved on to get their qualifications and insurance with the national motorcar group, NARCOA. We run yearly events for the enjoyment of our members like picnics, parties and motorcar outings, most at little or no cost to the individual. As a member of the VRA you are our first priority. To become a member of the VRA costs just $20 per year and for that you get everything above plus the chance to get closer to railroading than you ever thought possible. What­ever you can think of when it comes to railroading, we probably offer it – and if we don’t now, with your help we may in the future. Take a moment to fill out our membership form and start getting your hands dirty. We welcome anyone who wants to be involved in RAIL­ROAD­ING. If you feel strongly about railroad historical preser­vation and restoration please get involved. As our slogan says “SO CLOSE, ONLY THE PAYCHECK IS MISSING.” We get dirty, we get tired, we have fun. Becoming a member is only $20 a year! As you can see by reading our web site we are a very active group and we need as many good people as we can to keep up the good work. If you like to do anything or everything on, in or around the railroad this is the group for you. We charge $20 a year dues to our members because we feel that if you get involved and help this group meet it’s goals, that is enough. The Volunteer Railroaders get involved in everything from fixing the railroad to running passenger trains over the railroad. Do you like getting your hands dirty or maybe your thing is train ticket sales. What ever it is this is the place to do it. To join e-mail us at volunteerra@yahoo.com or call our HOTLINE at 973-238-0555 and say, I want to join! Leave your name and day and evening phone numbers plus your address and we will get you signed up and ON LINE. Please download and fill out the VRA Membership application form. We hold the meetings on the 3rd Thursday of the month in: February, May, August and November. Meetings start at 7:00 pm at the St Clements Church, 271 Lafayette Avenue, Hawthorne, NJ 07506. We try and get a show together for each meeting and so ask people who have something to let us know so we can schedule it, this does not always work so some meetings we have an open projector night where we allow members to bring what ever they want and show it with a limit of about 15 or 20 minutes worth. All are welcome, new members prospects as well. Revenue Service recognized as a non-profit under section 501(c)(3) of the Internal Revenue Code.